Current: What is Product Backlog Refinement? Product Backlog refinement is the act of adding detail, estimates and order to items in the Product Backlog. Ongoing Product Backlog Refinement is needed within each Sprint to refine items to be ready for future Sprints. 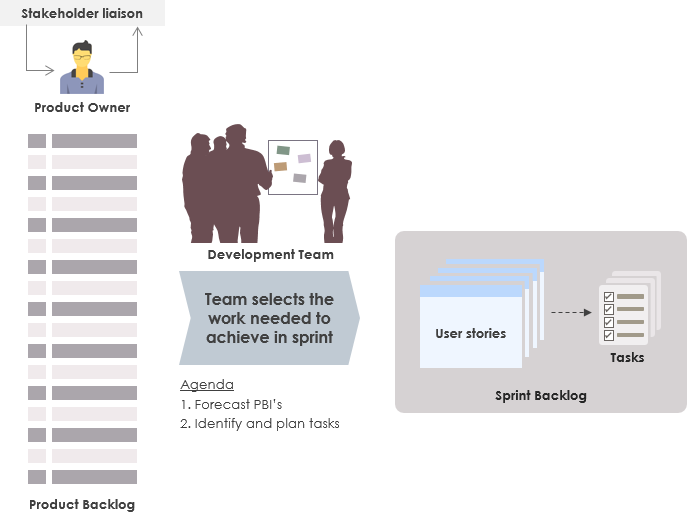 When the backlog items are refined to the suitable level of granularity, the Product Backlog items at the top of the Product Backlog (highest priority, greatest value) are decomposed so they fit within one Sprint as shown in the Figure below. Not all items in the product backlog will be of the same size and level of detail at the same time. PBIs that we plan to work on soon should be near the top of the backlog, small in size, and very detailed so that they can be worked on in a near-term sprint. PBIs that we won’t work on for some time should be toward the bottom of the backlog, larger in size, and less detailed. At the top of this Figure above are the orange, largest bricks. They represent the business goals to be achieved by the system, namely use cases or user features. At the next level down are PBIs that are bigger than a single sprint but smaller than a release. Let’s call the PBI at this level epics. At the third level, we find PBIs that are sized appropriately for a sprint—they can be completed in days rather than weeks. These items meet the team’s Definition of Ready and can be represented as user stories. At the lowest level, these PBIs can optionally to be broken down into tasks from a user stories and delivered by the end of a single iteration. Sprint Planning is often needed to be prepared for ensuring that the Product Backlog has been refined to an appropriate level of detail, with estimates and acceptance criteria (this is the purpose of Product Backlog Refinement). 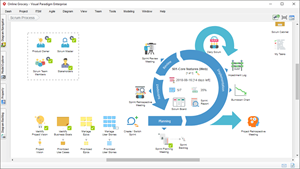 If the Product Backlog Items have been analysed and thought through during the product backlog refinement process, in the Sprint Planning meeting top priority Product Backlog items can be well understood and easily selected. The Product Backlog lists any required deliverables. Its contents are ordered by business value. As mentioned above, the most important items are shown at the top of the product backlog so the team knows what to deliver first. Backlog Item priority might change, requirements can be added and removed – thus the Product Backlog is a continuously maintained plan towards a growing business value. Product Backlog Items (PBIs) are the elements that make up the Product Backlog. 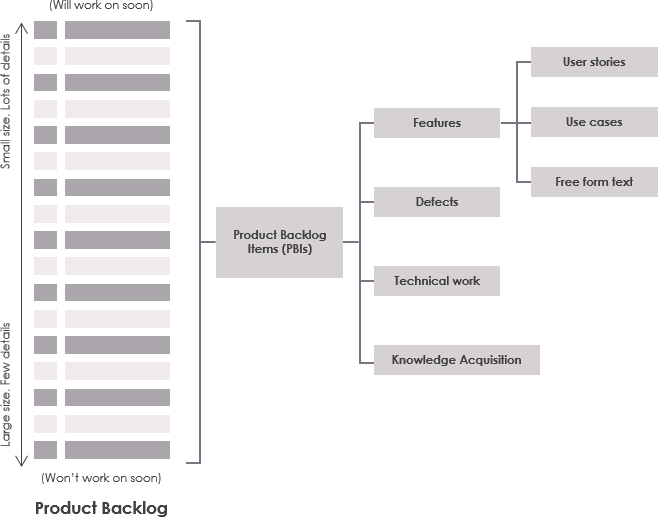 Product Backlog Items can range from specifications and requirements, to use cases, epics, User Stories, or even bugs, or time-boxed research tasks.